These little coats are made in a variety of ways. 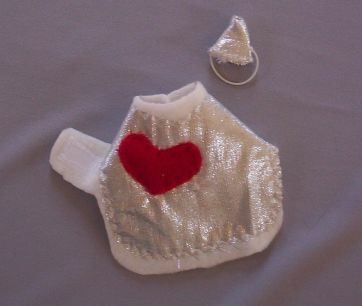 This one is a Cute little Silver Metalic fabric made into a Tin Man outfit from Oz. It has a matching hat that stays on with adjustable eleastic. I wish the photos showed the outfits better then they do. Please measure your animal before ordering these items. Each item may be of a little different size as they are all hand made, and every animal is built a bit different. 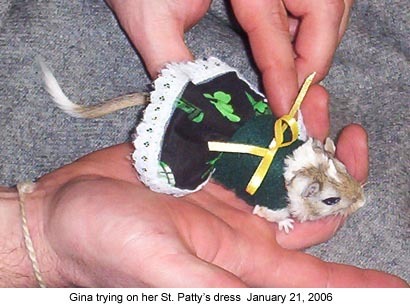 I try to change sizes a bit so that every small animal can have a new outfit to show of in. The waist measurement on the Coat waist is approx 6 1/4", it does have a bit of stretch in it, and the outfit is approx 3 3/4" from neck to tail.